Hideo Nomo (野茂 英雄, Nomo Hideo, born August 31, 1968 in Minato-ku, Osaka, Japan) is a retired Japanese baseball pitcher in Nippon Professional Baseball (NPB) and Major League Baseball (MLB). He achieved early success in his native country, where he played with the Kintetsu Buffaloes from 1990 to 1994. He then exploited a loophole to free himself from his contract, and became the first Japanese major leaguer to permanently relocate to Major League Baseball in the United States, debuting with the Los Angeles Dodgers in 1995. Although he was not the first Japanese person to play baseball professionally in the United States, he is often credited with opening the door for Japanese players in Major League Baseball, due to his star status. Nomo had become one of the most popular baseball players in Japan but after the 1994 season, Nomo got into a contract dispute with team management. The Buffaloes rebuffed Nomo's demands to have a contract agent and multi-year contract. 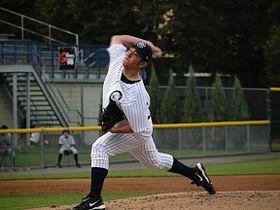 Because he was drafted by Kintetsu, the Buffaloes retained exclusive rights to Nomo; however, Nomo's agent, Don Nomura, found a loophole in the Japanese Uniform Players Contract to enable him to become a free agent. The "voluntary retirement clause" allowed a player who retired to play for whomever he wished after returning to active status. This led to him heading to the U.S., where in February 1995, the Los Angeles Dodgers signed him. Nomo signed with the Boston Red Sox in 2001 and started the season in spectacular fashion, throwing his second no-hitter in his Sox debut, on April 4, against the Baltimore Orioles, walking three and striking out 11. This no-hitter was the first in the 10-year history of Oriole Park at Camden Yards and made Nomo the first Red Sox to pitch a no-hitter since Dave Morehead in 1965. Nomo also became just the fourth player in baseball history to have thrown a no-hitter in both leagues (joining Cy Young, Jim Bunning and Nolan Ryan. Randy Johnson would later join them, becoming the fifth player after throwing a perfect game in 2004). It is the earliest, calendar-wise, that a Major League Baseball no-hitter has been pitched. Nomo also led the league in strikeouts for the first time since his first season in MLB. A free agent after the end of the year, Nomo returned to the Dodgers, in 2002, and ended up having his best season since 1996, finished with a 16–6 record, 193 K, and 3.39 ERA. The following year, he had another great season, going 16–13 with 177 K and a 3.09 ERA. During September 2003, however, he began showing signs of injury and fatigue. On January 4, 2008, Nomo signed a minor league contract for 2008 with the Kansas City Royals. If added to the roster Nomo would have received a $600,000 one-year contract and the chance to earn $100,000 in performance bonuses. On April 5, his contract was bought by the Royals and was added to the 25-man roster. On April 10, Nomo made his first major league appearance since 2005. He faced the New York Yankees in relief. He was brought in to start the seventh inning of a game while the Yankees were leading 4-1. Nomo loaded the bases, but was able to retire his native countryman, Hideki Matsui, to strand all three runners. However, he later surrendered back-to-back homers to Alex Rodriguez and Jorge Posada in the ninth inning. On April 20, Nomo was designated for assignment. The Royals released him on April 29, 2008. On July 17, 2008, Nomo officially announced his retirement from Major League Baseball. With an overhand delivery Nomo threw a fastball topping out at 95 mph and a forkball as his primary pitches. Nomo was elected to the Japanese Baseball Hall of Fame in 2014, only the third ever to be selected in his or her first year of eligibility. At the time, he was also the youngest player ever elected to that Hall of Fame, although his record was broken in 2018 by Hideki Matsui. ^ a b c d Whiting, Robert (October 10, 2010). "Contract loophole opened door for Nomo's jump". Japan Times. Retrieved 2 November 2015. ^ "Most Popular". CNN. Archived from the original on December 2, 2008. Retrieved May 4, 2010. ^ Brock, Corey (February 11, 2016). "Padres hire Nomo as baseball ops advisor". MLB.com. Retrieved November 22, 2016. ^ Brock, Corey (March 1, 2016). "Nomo eager to broaden Padres' Pacific Rim presence". MLB.com. Retrieved November 22, 2016. ^ Stephen, Eric (January 17, 2014). "Hideo Nomo elected to Japan Baseball Hall of Fame". truebluela.com. Retrieved January 17, 2014. ^ McIntosh, Whitney (January 16, 2018). "Hideki Matsui was elected to the Japanese Baseball Hall of Fame". SB Nation. Retrieved January 17, 2018. ^ "Athlete References in Rap Music". Rap Genius. Genius. Retrieved 2 November 2015.